The Hass avocado is known for its tumbled leathery fairly thick skin that turns near black when fully mature. The Hass avocado is an ideal avocado; it ripens evenly, it peels easily, its pit is easy to remove and it has a rich, nutty flavor with a creamy texture. 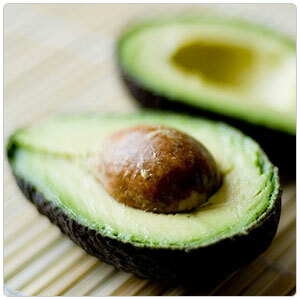 Unlike almost all other fruit, avocados don't get sweeter as they ripen, they develop a higher fat content. Avocados are almost always used raw in salads, relishes, salsas, purees and garnishes. There are close to 500 varieties of avocados grown throughout the world. There are seven varieties grown commercially in California, producing 90% of the nation's crop. The Hass variety (frequently mispronounced and misspelled as Haas) is the dominant variety, comprising 80% of the yearly crop. There are about 7,000 avocado groves in California; the average size is around 10 acres. These groves are located primarily along the coast from Santa Barbara to San Diego. San Diego County is considered the avocado capital of the United States, growing 60 % of the nation's crop. California avocados are grown and are available year round. Avocado trees need good soil, proper drainage and abundant sunshine to produce fruit. Throw in cool ocean breezes and steady year round temperature-the type found in the primary growing areas-and you create an environment that is conducive to a year round crop. However, as with most crops, there is a beginning, middle and end to a season. New crop avocados appear on trees in early December and reach maturity in early spring-it is at this time that quality, quantity and price are best. The season draws to a close in late August and early September, though some fruit will remain on the tree. Avocados do not ripen on the tree, so the tree can actually be used as a storage unit at this time. Avocados will ripen on their own in about10-14 days after being picked.